Given that Spring and New Beginnings are the themes of the month and we all LOVE to Dance, let’s try something new together! 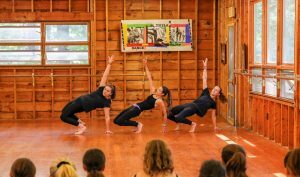 At Brant Lake Dance Camp we encourage everyone to try as many different dance forms as they can while at camp. Diversity in your training will not only make you a stronger dancer it will exercise your brain and stimulate your creativity as well. So, if you love your Contemporary at home try a Jazz class and a Modern class at camp. There is sure to be new ways to move and your body that you’ve never thought of before and you’ll love the way you feel when you master a new combination. Even better you’ll love the addition of this new found technique in creating your own Enchoreo piece. With three levels of Jazz, Ballet, Tap, Hip Hop and Modern professionally taught at BLDC you’re sure to find a new Love of Dance to add to your current Love of Dance. Going to camp was never about learning “life-skills” when I was a camper. I loved camp and returned every summer to have fun and hang with my friends. I didn’t realize until much later in life how beneficial spending every summer at Camp Laurel would be. So, with the ability to look back now, I’m going to talk about the most meaningful skills I gained because of my time as a camper. My college roommate once asked me how I was able to introduce myself to anyone and everyone so easily. This was the first time I realized how big an impact camp had on me. Camp Laurel helped me learn this early on because no matter how tight-knit our friends were, we were always excited to meet new campers and counselors. Camp also taught me to get to know people beyond first impressions. 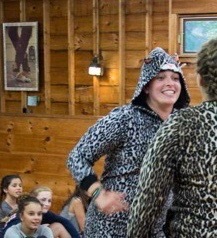 Sometimes it’s easy to make snap-judgments of people, but at camp I learned to never judge a book by its cover. My second night at camp I participated in one of my favorite camp traditions: Egg Drop. It seems so simple: our cabin is given supplies to safely drop an egg from the top of our climbing wall without breaking it. Looking at it now, I can see how intentional that evening program was because it allowed everyone in our cabin to creatively find a solution to our dilemma. But this is one of a countless number of opportunities to campers are given to communicate. Clean up, cabin dance-offs, Group Sing, College Days…All things that helped me learn how to communicate effectively with a wide range of other campers and counselors. There’s no place like camp to try new things. For seven weeks, I had the opportunity to learn how to waterski, climb, become a Laurel Gladiator, shoot a bow and arrow, try out for the play, learn an instrument, go camping, make something (anything!) in ceramics. And those are only the things that pop into mind on top of enjoying the things I loved before camp like basketball, tennis and painting. Camp Laurel let me get out of my comfort zone in the most comfortable way. I was able to try so much because the counselors were willing to instruct and coach me with a positive attitude. I never felt like I wasn’t good enough at something. Now, when new opportunities come about, I’m excited to try them and learn how to get better. Camp is all about having fun, developing friendships and creating memories that last a lifetime. Campers love the activities, living with their closest friends and trying new things. They could go on and on about how much they love wakeboarding, playing ping-pong during free time or simply laughing through every day. What campers (and counselors!) don’t always realize is how impactful their camp routine is. To an outsider, summer camp may look like little more than highly organized chaos: but the scheduling of Laurel South is very intentional, sophisticated and made for the benefit of each camper. Campers are waking up and going to sleep at roughly the same time each day. Meals are well-rounded with plenty of options. Campers are active for several hours and they’re constantly smiling. And while they experience different activities from day to day, the time spent at these programs is the same. Camp is unlike anywhere else because everyone is in a similar routine. And research shows that children and adults who have a structured schedule sleep and generally feel better. The routine of camp is often overlooked, but camp directors and parents know it’s one of the best benefits for children. I know that it’s a bit early but, I am definitely thinking of Spring. Don’t get me wrong, I have loved all of the snow that we’re having at Brant Lake this Winter but, I find myself crossing the street just to walk in the sun. An unexpected snow day is a great time to sort through all of your dance clothes and make room for new! I mean, we all have that leo lurking in the way back of the drawer that we have loved and can’t say goodbye to but, maybe we need to do a @MariKondo and thank it for all it has given to the joy in our lives and move on. So, don’t wait for the next snow day, do your Spring Cleaning and make your Top Ten List to bring to camp this summer. When was the last time you wrote a handwritten letter? When was the last time you went out to the mailbox to find a handwritten letter addressed to you? If you are like most people, receiving a letter in the mailbox instead of an inbox is a special treat to be treasured. The idea that someone took the time to sit down and put their thoughts to you on paper, find an envelope, a stamp and get it out into the mailbox is something to be admired in this fast-paced world, which is what makes receiving mail so special. At America’s Finest Summer Camps, campers look forward to filling their friends and family back home in on the details of their camp experience through a series of handwritten notes. But participating in the ancient art of “snail mail” is about more than just touching base with friends and family back home. Writing and receiving letters benefits campers in many ways. During their break away from school, students typically have fewer chances to practice their basic reading and writing skills. Writing letters helps campers fine-tune this skill in a way that is fun and personal. There is no pressure to get all of the spelling right or indent properly, just an opportunity for campers to practice their penmanship and creative writing skills. Receiving letters from home also gives them a chance to brush up on their reading skills. For campers who are growing up in a technology-driven world, a letter from home while at camp may be their first experience in getting something personal in the mail. There is an anticipation that comes with waiting for the recipient to receive their letter, and then excitement in receiving the response. This experience could foster a love and appreciation for handwritten notes in campers, and encourage them to continue the tradition throughout their lives. 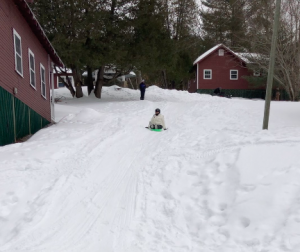 A letter from home can be just the thing a homesick camper needs to feel better. A letter is a tangible treasure campers can hold onto and look back on whenever they want. It is a tangible reminder of their life back home and a connection to their loved ones. Campers can write as many handwritten letters home as they wish. They are encouraged to use their quiet times to reflect on their day and write about their experiences and adventure to share with people back home. 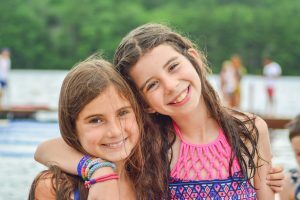 A summer at sleepaway camp introduces campers to some of life’s most simple pleasures, such as songs around a campfire, enjoying a sunset and appreciating the art of snail mail. Just another way America’s Finest Summer Camps gives campers experiences that they may not have had anywhere else! A rainy day at camp is better than a sunny day stuck at home! Summer weather in the northeast can be unpredictable. Sometimes you have weeks of high temps and sunshine, other weeks you’ve got off-and-on rainstorms. Thankfully, America’s Finest Summer Camps are designed to provide an exceptional camp experience, rain or shine. When it rains, the entire camp is prepared. There are countless indoor activities to keep campers entertained and occupied until the sun comes back out. There is no better way to spend a rainy day than enjoying a good show. America’s Finest Summer Camps give creative campers an outlet to work on their performance and musical interests. 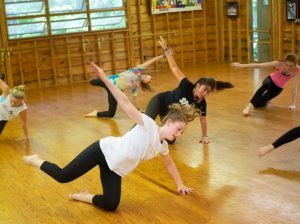 From theatre improve to dance and instrument practice, campers can express themselves through the creative arts. Regardless of skill level, every camper is welcome to participate in some of the many performing arts options at camp. While music, theatre, and dance may be the rainy day option for some, other creative campers prefer the visual arts. America’s Finest Summer Camps introduces campers to woodworking, ceramics, drawing, jewelry and candle making. Aspiring artists can channel their inner creativity in many different ways at camp. 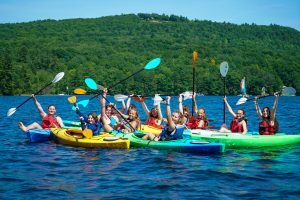 The America’s Finest Summer Camp experience is designed to give every camper a unique and personalized sleepaway camp experience. This is why some programs offer additional options for campers who have specific interests, such as radio broadcasting, science, cooking, and digital photography. These options keep kids in their zone as the rain comes pouring down. While many of camp’s sports programs are designed to be played outside in the beautiful summer weather, some indoor options allow campers to stay active without getting soaked. Gymnastics, fitness and aerobics, figure skating, and basketball are a few examples of sports that can be moved indoors. These options give campers plenty of possibilities for rainy day fun. America’s Finest Summer Camps always have a plan. Camp staff and counselors are prepared for rainy days and have tricks up their sleeves to ensure a rainy day is still just as much fun as a sunny days. The best part about rainy days at camp is that you are still surrounded by friends. We never let a little rain ruin our fun at camp. No matter what the weather forecast says, campers fill every day with new activities, great food, new friends and adventure! A significant number of our counselors are campers who just can’t get enough of America’s Finest Summer Camps. 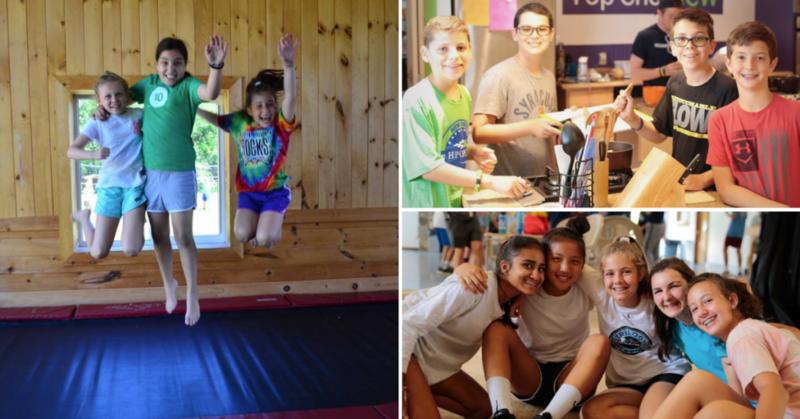 Some of our veteran camp counselors and staff members started out as wide-eyed, excited, first-time campers who fell in love with sleepaway camp. The camp experience is ingrained so deep into their life that there’s no place they’d rather spend their summer. Some can barely remember a summer that wasn’t spent at America’s Finest Summer Camps, and they love it that way. The first year a counselor comes back to camp in a leadership position instead of a camper can be a surreal experience. As they grow as campers, they are given new roles and responsibilities in leadership that prepares them for this role. They serve as big brothers and big sisters for first-time campers and are trusted by counselors and staff to set a good example for younger campers. This prepares them for their role as the ultimate summer role model. When campers evolve into counselors, it means they are fully equipped and ready to help first-time campers have the happiest, safest and most memorable summer of their lives. Counselors who grew up at summer camp know the campgrounds like the back of their hands. 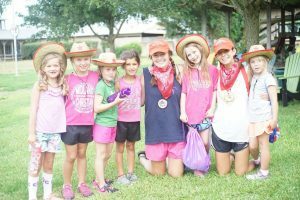 They have formed relationships with other counselors and staff, are familiar with schedules, rules, traditions, and expectations that make camp run smoothly. Their experience as a camper gives them a head start on camp routines and helps them lead in confidence. 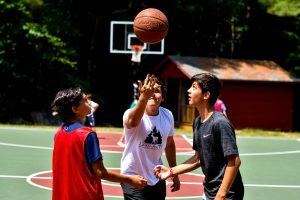 Full circle counselors, those who transition from camper to counselor, can share the love of sleepaway camp in a way that others can’t. New counselors can learn to fall in love with camp, but full circle counselors have this love embedded in who they are and naturally share this love with new campers. These counselors have experienced almost everything a camper can experience, so they’re able to relate with common new camper experiences. America’s Finest Summer Camps loves all of our counselors, but there is a special place in our heart for full circle counselors. We’ve watched these campers grow and evolve into responsible young adults who are passionate about providing the best sleep away camp experience for every camper, just like a counselor did for them. 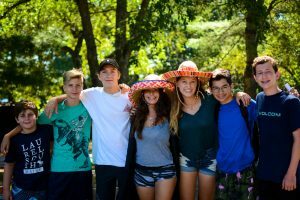 The first summer spent as a counselor is a unique blend of new experiences and comfortable familiarity. Counselors quickly fall into the familiarity of camp, while happily embracing their new roles and responsibilities. Every day is different as a counselor and provides a new appreciation and respect for the leaders who came before them. Every year, campers reach the point where they have to decide whether to end their summer camp experience or come back as a counselor. We know that being a camp counselor isn’t for everyone, but view it as the most significant indicator of success when campers choose to come back as a leader. Camp wouldn’t be the same without our dedicated counselors! Camp means a lot of different things to a lot of different people. For first time campers, it’s about trying new things and making new friends. Counselors revel in the idea of sharing their passion every day in a new place. 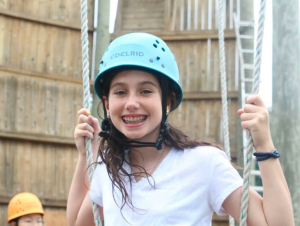 Parents know that Laurel South instills confidence, allows campers to take safe risks, and helps them develop their social, physical and emotional skills. At Laurel South, our counselors are very skilled in the activity they instruct. Our athletic fields and courts are populated by college athletes. Our InterArts program features many counselors majoring in their chosen fields. The same can be said up and down our staff roster in Adventure, Special-Areas and the Waterfront. Our counselors also have the strong desire to share their craft while working with children. This creates a unique environment of understanding and skilled counselors, willing to meet each camper at their current ability level. Ask our counselors how they first got involved in their activity and they’ll light up with memories of their early coaches and teachers. They remember someone else taking the time with them and want to have a similar impact on their campers. Counselors understand that campers need to have an excitement of a new craft before they begin to develop skills. Coaches and instructors are thrilled to spark an initial interest in an activity and are talented enough to develop campers’ skills. 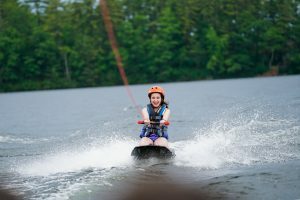 And while camper’s may not realize how life-changing that is immediately, they’ll look back with fondness on their summers at Laurel South when they realize how they first found joy into their favorite activities. Athletics at Camp: Good for the Body, Good for the Mind! Being active is good physically and emotionally! America’s Finest Summer Camps combine the classic traditions of summer camp, like s’mores around a campfire and exploring the outdoors, with the physical activities that are designed to challenge campers both mentally and physically. Spending the summer at camp means having ample opportunities to improve upon a skill you already have or to learn something new. There are team sports and individual sports, giving everyone a chance to find a sport that fits them. The beautiful thing about athletics at camp is that campers learn so much more than the rules of the game. Participating in athletics at camp not only makes you a better athlete, but it makes you a better person. Camp is a safe place to try new things. Sports at camp push campers out of their comfort zones while still ensuring they are being safe and having fun. 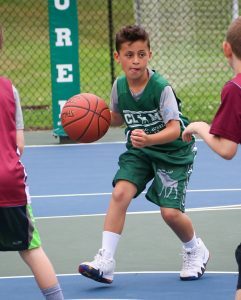 Campers are taught the rules of the game and given appropriate equipment to ensure they can play their best, regardless of their skill level. Sports like soccer, baseball, basketball, lacrosse and roller hockey require you to work on speed, agility, and coordination. Gymnastics and dance is an excellent option to improve balance and flexibility, and fitness classes and cheerleading are sure to get your heart rate up. Regardless of your fitness level or ability, everyone can experience the joy of participating in sports. The habit of getting outside and getting your heart rate up is something that you can implement into your lifestyle far after you leave camp. Focusing on getting daily exercise, along with learning to balance your meal choices and getting enough water each day helps to build a foundation for a healthy lifestyle. Sometimes, just trying a new sport can do wonders for your self-esteem. You can gain a new level of confidence from simply trying something you didn’t think you could do. This is just one example of how athletics are such a vital part in summer camp character building. Participating in sports fosters teamwork and accountability, patience and persistence, and effective communication skills. Practicing a sport over and over engrains the discipline and healthy habits into growing campers. It has also been proven that children and teens who play sports get better grades and have a more well-rounded social circle. Athletics can be a great stress reliever and improve problem-solving skills. Another great thing about playing sports at camp is that you are playing for fun. There is no pressure from sideline parents and no scouts to impress. Campers simply play for the love of the game. You are allowed to play without the fear of making a mistake or disappointing your team. Everyone is on the same team. Campers learn how to enjoy healthy competition, and handle both winning and losing with grace. At America’s Finest Summer Camps, you get the traditional camp experience with a bonus: endless opportunities to improve your mind and your body and to have a lot of fun while doing it. 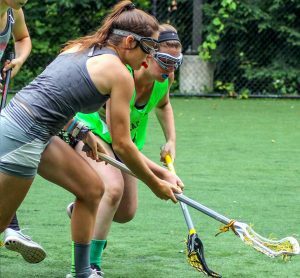 Campers can focus solely on one sport or branch out and try them all, either way, you are learning valuable life skills that you can use both on and off the sports field.